It is a miracle this cake made it. I started baking early in the afternoon, just after lunch. First the butter and brown sugar were brought to a rich and creamy dark brown in my cast iron pan. Cranberries were cooked in orange juice until they popped out of their skins. The cake batter called for 1/2 cup of whole milk, but I only had 2%. So I used 1/4 cup 2% milk and 1/4 cup half & half. I figure that the cake wouldn’t mind the extra moisture and I am going to forget those extra calories even exist. It’s all about tenderness (from fat) and flavor when it comes to baking anyway. I pulled the cake out of the oven, set it on the stove to cool and rushed out the door without a glance back. An hour later, we returned and I went straight into the kitchen to check on the cake. Strange, the center was a little sunken in. I flipped it out of the pan and onto a tray. Everything looked okay. 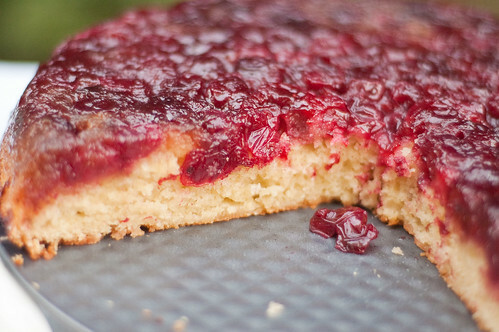 Caramel and cranberries held together on top of a golden layer of cake. It looked pretty. Could I do that? Put it back in an hour after I took it out? After it had completely cooled and been cut into? Would it work. Well, there is no reason not to try. I gently replaced my piece of cake, flipped the whole thing back into the pan and slid it in the oven for another 15 minutes. This time, when the timer beeped I pressed gently on the middle of the cake. It sprung back energetically. It’s definitely done now. I let it cool and cut another piece. Perfection. 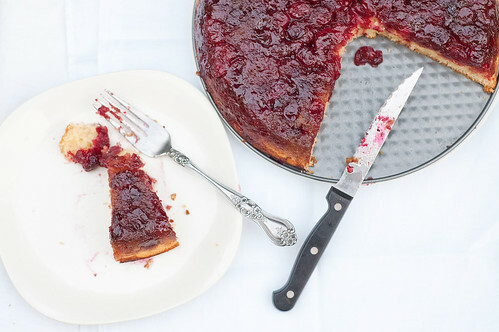 The cranberries are tart and juicy, cutting the sweetness of the sugar caramel just enough. The cake is tender and moist. It did not crumble at all, but clung to the cranberries like a Siamese twin. My first piece never made it to the photo table. I couldn’t stop taking bites, it’s so good! The second piece lasted long enough to be photographed, but I had to eat that one too. Not that I minded. 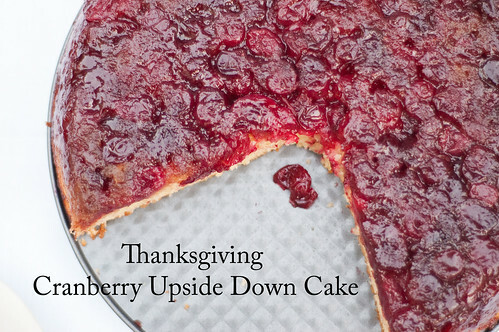 Thanksgiving is a great time to make this cake. Once you taste how blissful it is you will want to share it with friends. I gave half our cake to Tom’s partner at work. Just what a guy needs after a long grind. 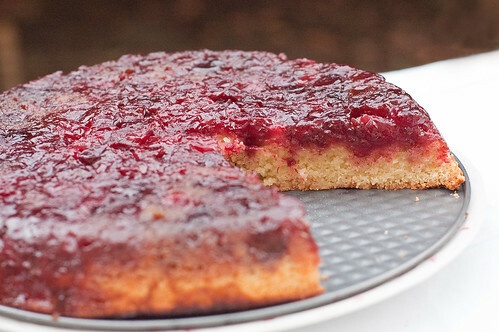 Fresh cranberries will be easy to find during the holidays and apparently if you screw up the baking, this cake will forgive you and be delicious anyway. 1. Preheat oven to 350F. Take butter, 2 eggs and 1/2 cup milk out of the fridge to warm. 2. Measure 4 tablespoons (1/2 stick) butter and brown sugar into a 8 inch cast iron skillet or heavy-duty cake pan that stove & oven safe. Cook over medium heat, stirring constantly, until melted and bubbly. Remove pan from the heat and allow to cool. 3. In a small saucepan cook together cranberries and orange juice on medium heat until the cranberries begin to pop. Remove from heat and pour evenly over the cooled caramel. 4. Separate the egg yolks from the whites. Set aside. Stir together flour, baking powder, and salt in a small mixing bowl. 5. In a large mixing bowl beat 1 stick of softened butter to lighten. Add granulated sugar and cream until light and fluffy. Beat in the egg yolks one at a time. Stir in vanilla extract. Mix well. 6. Add flour and milk, alternating and adding only 1/3 of each at a time starting and ending with the flour (like this, 1/3 of the flour, 1/2 the milk, 1/3 flour, 1/2 milk, 1/3 flour). Stir until combined, but don’t overmix. 7. In another bowl beat the egg whites until they hold soft peaks. Fold in 1/3 of the egg whites into the batter then gently fold in the rest until all egg white is incorporated. Pour the batter into the pan on top of the cranberries and caramel. Smooth the top with a spatula. 8. Bake for 30-35 minutes or until the top is golden brown (really golden, not light golden) and the cake pulls away from the edge of the pan. If you still are not sure then make sure that a toothpick inserted in the center comes out clean. Remove from the oven and allow to cool for 15 minutes. 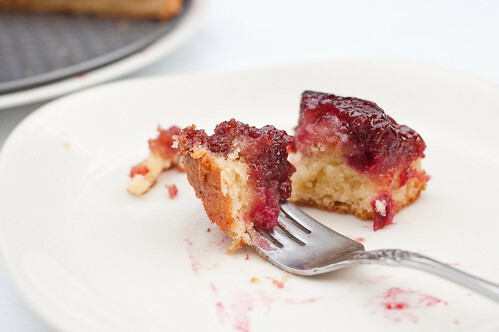 Run a knife around the edges to loosen then place a plate right side down on top of the pan and flip the pan over to release the cake onto the plate. V E R Y nice ……that looks and sounds completely delicious, and right in my flavor bullseye. I will definitely be keeping this recipe and giving it a go here soon. Which makes this cake EVEN BETTER for cooking itself to the finish, after you got back from the conference!!! As always, gorgeous photos, Melissa. Nice touch with orange juice – I’ve made Nigella Lawson’s version couple of time (and blogged about it few years ago). Cranberries and oranges go so well together, so come next Christmas (sorry, we don’t do thanksgiving here :)), I might use orange juice myself!